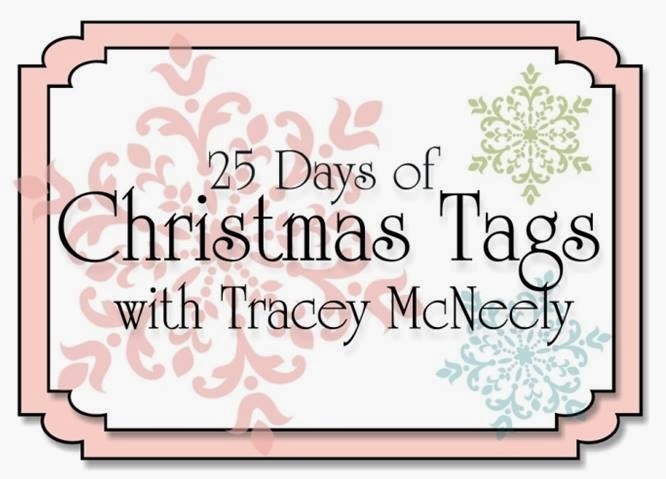 Tracey asked me to join her for today's installment of her 25 Days of Christmas Tag series. I don't usually make tags. A few years ago, my mom gave me one of the best gifts ever - she made each of us a set of different-sized fabric drawstring bags for wrapping Christmas gifts. This is an eco-friendly tradition that my mom has had in her house for ages - we each have a set fabric pattern, so we don't need tags - we know who each present belongs to. I don't sew, so this gift of these bags is so appreciated - especially every year when it takes me about half an hour to 'wrap' everything and place it under the tree. And I tell my kids that I have a special way of tying the bows so that I would be able to tell if anyone tampered with them! So having told you all that, I do need to make tags for the teachers' gifts. Because Kate attends a school that is very multicultural, the gifts and tags need to be gender neutral and religion-neutral. Usually, we give them Tickleberrys. (Chocolate covered dried fruit), but I didn't have any on hand for the photo, so I used leftover Halloween Candy! I love the long shape of the tag - it allows for the colourful message on the front and lots of room on the back for Kate to write "From Kate". I used CSS' Alpha Duo, overlapping the letters as I went. Coloured with Copics, edged in Stickles and quickly tied with silver cord. I think it's ok for tags to be cheap and cheerful - unlike cards, I suspect they get thrown out with the wrapping. The long tag is very cool! I love the spectrum of colors as always. I need to adopt your mum's idea as well. I like your bright and cute tag! 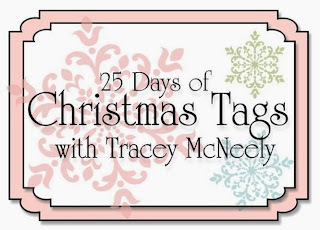 Love that long tag Ardyth...this is so cute and I especially loved that story about your mom and the holiday bags. That is a great idea! I love the long tag and the way you colored it. ....left over Halloween candy....are you kidding me? Send it over! Great choice of colors - festive but in a neutral way. Love the silver ribbon. I'll fight Geri over the chocolate...! What a sweet tag. So unique and different than the usual tags found at this time of year. Just love all the colors. Your mom is so smart!! I never used tags either...the kids wouldn't shake or sneak peeks at the packages meant for grandma/grandpa and they always wondered how I knew who's was whose! Teeny tiny initials hidden on the ends did the trick! "special way of tying the bows"...i have always thought you were a genius, and now i know for certain. these are totally darling, like all your wonderful creations. thanks for sharing. thanks for the inspiration! What a great idea of your mum's! 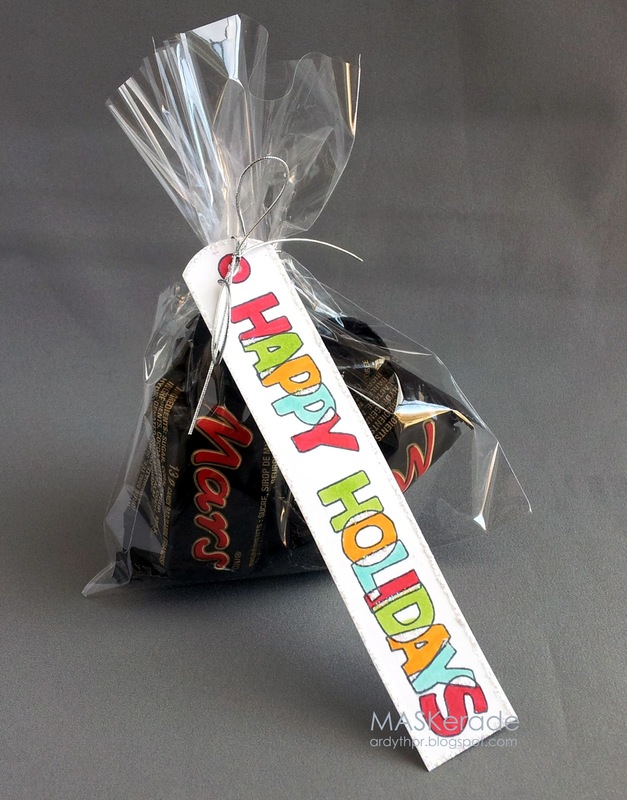 I think I'll make a set for DH to use for me, cos he can't wrap for toffee! Love the gender-neutral/religion-neutral tag. And the mini Mars Bars! Love your white intersections on your tag! And wow, another great idea ... so you mean that every gift you get for Kate goes into a big bag with her pattern on it, and that's it?! ?